Just off the ocean in Pacific Beach and housed in a gracious Mediterranean-style property is Surfside 1 Pacific Beach. 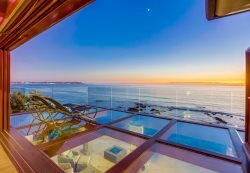 With 4 bedrooms, 2 bathrooms, an outdoor space with views of the Pacific Ocean and steps away from the beach, this is the vacation home you’ve been dreaming of. This property encompasses the entire first level of a 2-home duplex and has a separate entrance and outdoor space. The open-concept living area boasts leather furniture in front of a roaring fireplace and large wall-mounted flat-screen TV. Recessed lighting casts a soft glow over the space making it the perfect setting for a group evening relaxing and enjoying the west coast. The dining area is tucked away in a charming alcove under a colorful wall display and chandelier. A minimalist dining table easily accommodates a group of 6 with additional seating at the nearby breakfast bar. Drenched in sunlight and with views of the ocean, the kitchen has the feel of a professional chef’s space with its stainless steel-faced cabinets and appliances, slab granite countertops and elegant, streamlined vibe. Surfside 1 truly shines with its prime Pacific Beach location and close proximity to the beach. The ground level gated patio in the front yard is surrounded by vibrant, tropical foliage giving it a true California beach feel. This outdoor living space comes with a round stone table and surrounding benches for outdoor meals, as well as lounge seating complete with a fire pit. From the front of the home, it’s only steps down the sidewalk to a grass park on the bluff overlooking the beach. The park offers beach access and an incredible spot for sunsets. Sink your toes in the sand, play some volleyball, build a sand castle or paddle out on your board and enjoy one of the locals’ favorite surf breaks. If you take a stroll along the beach south you will end up at Crystal Pier where you can walk out over the ocean and take in the views from Point Loma to Mission Beach, La Jolla and beyond. Miles and miles of ocean and beachfront boardwalk are here for your pleasure! Surfside 1 is the lower home of the complex, offering the versatility, location and amenities for an incredible vacation in Pacific Beach. We look forward to welcoming you. Booking was easy and efficient. I was hesitant to book a property that had no reviews, so I called Bluewater Vacation Homes to get the scoop. They indicated the property was a new rental property for them and thus no reviews yet. The gal I spoke with had been to the property and assured me it was as nice as it appeared from the photos and description. Everyone in our group enjoyed our stay at this property. Steps away from the beach was a big draw. Great. Caring service from start to finish. Beautiful property. The views from the kitchen, front and back yard are awesome. The amenities are top notch.